The president’s fully-grown dog with impeccable breeding is taking poops in the White House. First Lady Michelle Obama laughed about the animals defecating in the "People’s House." She said the Portuguese Water Dogs, would still be rewarded with "lots of new toys and treats" for Christmas. "They have been very good dogs," Obama said at a recent children’s event, the Hill reported. "I mean, Sunny can be naughty. Because you know what she does sometimes? She leaves the kitchen and she’ll sneak, and she’ll go poop on the other end of the White House." "We’re dealing with that problem," she said. Sunny, who cost roughly $2,500 and is the cousin of this year’s favorite at the Westminster dog show, has apparently been crapping in the White House for years. The dog was not potty trained when the Obamas got her in 2013. 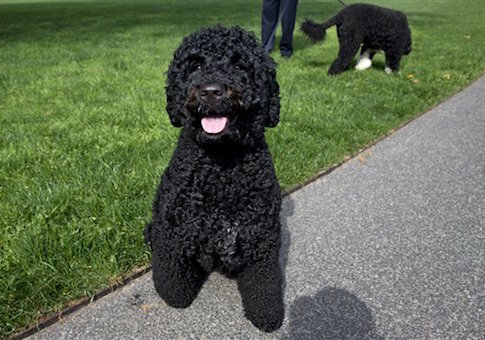 The Obama’s first dog, Bo, was trained by a dog trainer of the "political elite" Dawn Sylvia-Stasiewicz, who died in 2011. Sylvia-Stasiewicz also handled potty training for Ted Kennedy’s three dogs. She said Bo was an "attentive student who never disappointed," or had an accident. Sunny, on the other hand, appears to be a terror who poops in the White House and knocks over two-year-old children in her wake.